Readers who were children during the 1950s may well have fond memories of a very rare type of doll – the Beauty Skin. Made by Pedigree, these lovely dolls were certainly not rare at the time. On the contrary they were very popular, especially with young children, because they were so soft and cuddly. Sadly, though, the dolls had a fault – they tended to disintegrate after a few years of play. Pedigree Beauty Skin dolls first appeared in the late 1940s, and were popular until the mid-1950s. They came in four sizes, but the smallest had a rubber head, unlike the hard plastic of the larger sizes. These rubber-headed dolls were 9” high, while the hard plastic headed versions were 14”, 16” and 20”. Although their heads were hard plastic, their bodies were made from a soft thin rubbery latex material and their limbs were of a similar substance, stuffed with kapok. They had pretty faces, often with flirty eyes, and most had moulded hair. Gradually, after lots of loving and cuddles, the latex would split or turn brittle, and the kapok would emerge, leaving a split and empty arm. Eventually, the dolls would be so damaged that they would be thrown away, which is why they are so rare today. Some people tried to stop the splits with sticking plaster, but this was a disastrous thing to do, because once stuck to the latex it could never be removed. It would turn grubby and unsightly. Sadly some owners of the dolls still resort to this method of stopping the kapok emerging, today, but it is not recommended. I called my first Beauty Skin baby Jeannie, and loved her very much, but eventually she was so damaged, I couldn’t play with her. So when I was asked what I would like for Christmas – I must have been about six – I asked for another soft doll, just like Jeannie. I found Isabelle on Christmas morning wearing a white satin dress, lying in a little blue-draped metal crib. I loved Isabelle dearly, and I had her for many years, even though her right arm slowly, but completely, disintegrated. I used to take her on holiday with me, and she rode in my doll’s pram. Eventually the day came when my mother decided I was ‘too big’ for dolls, and so most of my babies had to go. Isabelle had to be put into the dustbin – no-one would want a doll with a perished arm – though Mum kindly offered to do it for me, knowing how much I loved that doll. When I started collecting dolls, I searched everywhere for a Beauty Skin, and kept a lookout at all the doll fairs, but no luck. Then one day, about six years ago, my daughter and I visited our local Collectors’ Centre. Suddenly I saw her pick up a doll from a table, and turn to me in triumph. She had found me a Pedigree Beauty Skin! Apart from one tiny crack in the rubber skin on the palm of one hand, she was perfect, and was the first one I had seen since my beloved Isabelle was thrown in the dustbin all those years ago. She is slightly larger than my original Isabelle, and her face is a little different, but her fingers, her toes, the way her moulded hair is shaped into little curls around her forehead, are just as I remembered. My Beauty Skin wears her original white satin-edged cotton romper suit, and takes pride of place in my doll cabinet. Now, though, she normally has a light cotton dress and jacket placed over the top of her romper, just to ensure that when she is handled no damage can get to her skin. A couple of years later, my daughter came hurrying over to me at a doll fair, to say she had found another, smaller, Beauty Skin! This one was just 9” high, and was immaculate, with a soft head, rather than the hard plastic head of the larger-sized Beauty Skin babies. Still boxed and wearing her blue dress, bonnet and socks, she must have been ex-shop stock. Then, recently, I came across yet another large Beauty Skin. This one, although not in such perfect condition as our other doll, is, I believe, unplayed with, but poor storage has caused her to disintegrate on one thigh. However the facial colouring is wonderful, with cheeks as pink as the day they were painted. She is 16” tall, wears her original lilac and pink romper suit and lacy net socks, and comes with her box and even the delightful letter which Pedigree gave to all the new young ‘mothers’ of Beauty Skin babies. I hope that you will love me too. I am a Baby – after all! And I’ll be clean as clean can be,. And go to sleep when play is done. One popular style of Petalskin, or ‘flexible vinyl’, doll was known as Lindy. Lindy had moulded hair which was in a ponytail style, and a ribbon threaded through a hole in her head. 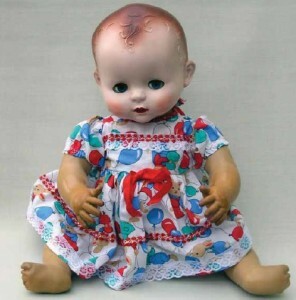 This doll came in Springtime or Summertime versions, wearing either pretty floral print dresses or plain cotton with ribbon trim, socks and shoes. Petalskin dolls are pretty, the skin texture and translucence is appealing, but I find that they don’t have the vulnerable attraction of the Pedigree babies with their thin, latex skin. For me, as the Pedigree Beauty Skin dolls were so much part of my childhood, they are very special and I will continue to seek them out. One day I hope to find the 14” dolls which have the faces of my beloved Jeannie and Isabelle.